At our practice, we not only offer exceptional dental services, but we	provide knowledgeable patient education as well. As a full general and	cosmetic dentist practice, we are committed to serving our patients of	all ages with professional, skilled, comfortable, and effective dental	care. From teeth whitening to dental emergencies, we have more than three	decades of experience addressing all types of dental concerns and problems. Call our office now at (410) 437-5900 to learn more about the dental treatments	and procedures we provide. If you have any questions about insurances we accept, please contact our	office today at (410) 437-5900. 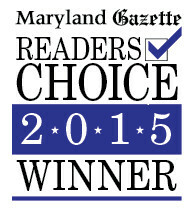 Named Best Dentist/Oral Surgeon in the Maryland Gazette in 2015, we are	proud of our continued effort to treat every patient with the professionalism	and respect. It’s our goal to make sure you completely happy with	your dental care. We hope to treat your dental concerns as quickly as	possible in order to minimize discomfort and disruption to your daily	life. Whether you need a routine dental cleaning or are suffering from	a toothache, we are here to help. We offer all general and cosmetic dental services in our beautiful, comfortable,	and conveniently located office. Our friendly staff members are available	to answer any questions you might have, so don’t hesitate to contact	us at your earliest convenience. To learn more about our dental services,	reach out by phone, email, or in person. Our goal is to make visits to	the dentist quick and as enjoyable as possible. Call us at (410) 437-5900 to schedule your dental appointment today!